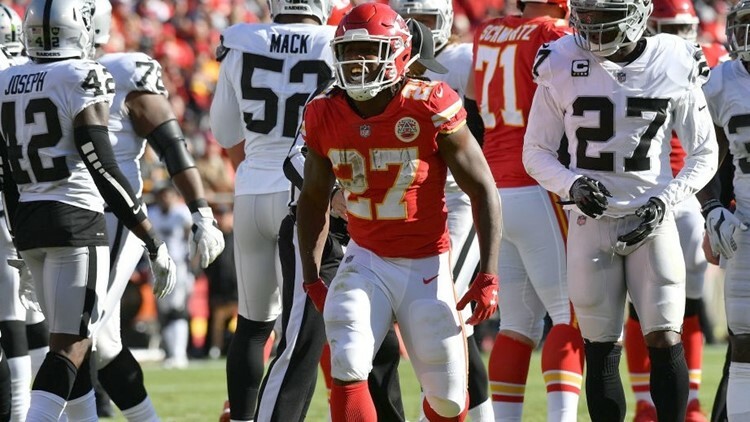 Chiefs RB Kareem Hunt has averaged 127 total yards/1.3 TDs over his last seven games, despite hitting the 20-rush mark once during this span. 11Alive Sports serves up 10 gloriously fun facts to digest, in advance of NFL Week 13.
b) Unwittingly pushing your spouse or family to the absolute breaking point of delirium, assuming they don't also eat, breathe and live for football. 1. Colts quarterback Andrew Luck has passed for three or more touchdowns in eight consecutive games, just two outings shy of Tom Brady's NFL record from 20017 (Weeks 1-10). a) Jacksonville has allowed only 1.4 passing TDs per game, the second-lowest tally in the league. b) Of his last seven games played outside on grass, Luck holds mere averages of 248 yards passing and two passing TDs. Kareem Hunt hasn't cracked the 100-yard rushing threshold in his last seven games. Of course, during this same stretch, the Chiefs tailback boasts supreme per-game averages of 127 total yards and 1.3 touchdowns. The odds of Hunt eclipsing the above tallies are excellent. The Raiders possess bottom-10 rankings with rushing yards allowed per game and receiving TDs surrendered to opposing tailbacks. 3. The Steelers' tandem of Antonio Brown and JuJu Smith-Schuster rank 1-2 in receiving targets since Week 8, totaling 98 during this prolific stretch. Charting his last 12 November/December home games, QB Ben Roethlisberger owns staggering averages of 350 yards passing and 3.1 TDs. That's quite a big sample size; and yet every time, there are a handful of Doubting Thomases when playoff bids are on the line. Oh well ... good luck with your Plan B. Of his last nine complete games against the NFC East, Ertz holds remarkably consistent tallies of eight catches, 81 yards and one touchdown. And this includes the clunker of all clunkers, catching only two balls for eight yards versus the Cowboys. 5. On Monday night, Texans tailback Lamar Miller became the first player in NFL history to post multiple rushing touchdowns of 95 yards or more. Which begs the question: What kind of track record does Miller have following great games? Charting his five total outings with Houston after hitting the 100-yard rushing mark, Miller holds rock-solid averages of 92 total yards and 0.4 touchdowns. This week, Miller draws the Browns defense, which ranks in the bottom-6 for rushing yards and rushing TDs allowed. 6. Seahawks quarterback Russell Wilson has accounted for multiple TDs in 20 of his last 22 games. Of his last 10 outings against the 49ers, Wilson tallied zero or one touchdown a staggering eight times. 7. Packers wideout Davante Adams has racked up 100 yards receiving and/or one touchdown in 12 of his last 13 games, with the lone clunker involving eight catches, 14 targets and 81 yards (vs. Buffalo). Here's another fun thing to celebrate: Against the NFC West this year, Adams owns absurd averages of 8.3 catches, 144 yards and 0.3 TDs. Citing his last six games played indoors, Gurley has solid, but hardly elite averages of 94 total yards and 0.3 touchdowns. Is it possible the Rams' prodigious offense works better outside ... on natural grass? Of course, that doesn't mean Gurley should be benched in any situation this week. Last we checked, the Lions were surrendering 5.2 yards per rush. 9. Go ahead and book Emmanuel Sanders for fantasy greatness this week (@ Bengals). Citing his previous nine outings against AFC North foes, Sanders owns rock-steady tallies of 6.1 catches, 83 yards and one TD per game. Of equal importance, the Bengals have allowed opposing wideouts to post a sterling catch-to-target rate of 63 percent this season. a) Tampa Bay has surrendered the most TD passes this season (26). b) The Bucs rank 27th against the pass, allowing 292 airborne yards per game. c) Opposing quarterbacks own a staggering TD-INT ratio of 26/3 against the Bucs. **Panthers QB Cam Newton has notched multiple touchdowns in 10 straight games. **Charting his last seven games, Newton has stealthily averaged 296 total yards and 2.3 touchdowns.